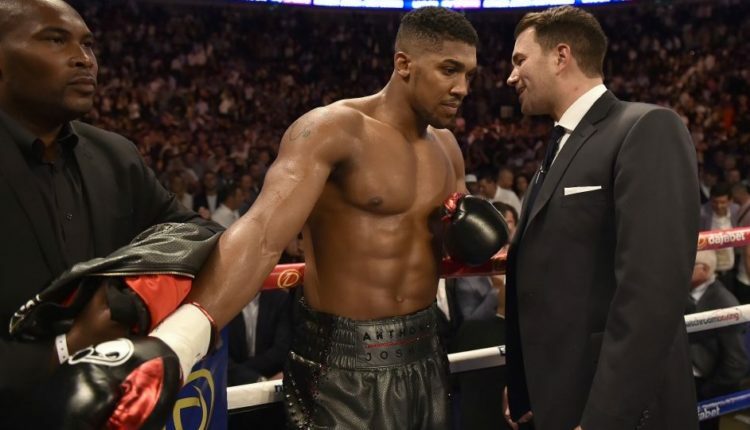 As his fighter prepares to face Alexander Povetkin, Eddie Hearn is still awaiting on communication from Anthony Joshua’s rival, Deontay Wilder. Joshua and Wilder have been entangled in protracted in negotiations since their respective wins over Joseph Parker and Luis Ortiz in March, with both fighters eyeing a showdown this fall. Yet, both sides would go after one another in the media as a form of negotiations and lead to WBA mandatory challenger Povetkin being slotted in a September 22nd face off with Joshua at Wembley Stadium. If both Joshua gets through Povetkin and Wilder is able to get through possible opponent Tyson Fury in November, the two can possibly face off at Joshua’s next booked fight on April 13th at Wembley Stadium. Hearn claims that his side is doing everything in their power to make a fight happen, but claims that there has been no reply from Wilder co-manager Shelly Finkel. “If there’s even a chance that an undisputed title fight could happen in April, you’ve got to at least talk about it. Maybe they don’t use emails – maybe Shelly uses carrier pigeons or smoke signals. I’m going to strap a note to a pigeon’s leg and send it to New York,” Hearn said to Sky Sports. “It’s not a case of saying they’re concentrating on Fury. It’s the promoters’ job to plan ahead. It’s frustrating because there’s limited time to make the fight. People must be realising that they don’t want the fight because, if they did, why haven’t they replied? If Hearn is unable to secure Wilder, it seems it will be former opponent Dillian Whyte who faces Joshua. Joshua stopped Whyte in the seventh round of their December 2015 showdown, but would eventually be stopped by the former Olympic champion. “At the moment [Whyte is the frontrunner], yes,” explained Hearn. “[Whyte] is first going to fight in December. We are negotiating, talking for December 22 at The O2.